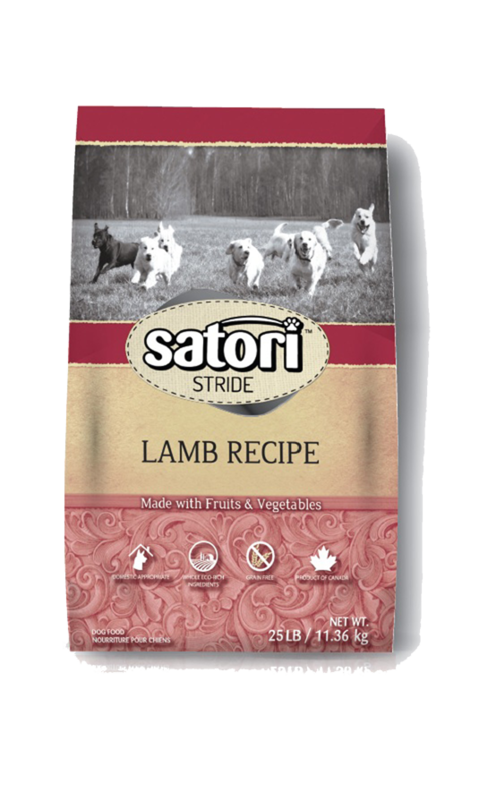 Satori Lamb Recipe is the first Domestic Appropriate pet food specially designed to bridge the gap between your canine’s anatomy and modern lifestyle. Our lamb recipe has a logical approach as it considers canines, like the wolf, have digestive systems setup to efficiently process meat therefore it is grain free and made with fresh lamb. We then took it a step further by understanding our pets caloric needs are not the same as their wild ancestors since they do not travel 20-25km per day hunting and searching for food. These differences are the reason we adjusted the nutrition to fit their domestic lifestyle which consists of living in houses and backyards where their meals are served to them. Our ingredients are selected based on their quality, as we know that only the highest quality will do for our pets and yours. All of our ingredients must meet a supplier approval and raw material program that analyzes nutritional and safety standards. This ensures only the highest of quality ingredients make it to your pet’s bowl resulting in a taste they will love. We are proud to source Canadian ingredients which provide essential nutrients for your best friend. *We care for our environment; our packaging is Recyclable and Sustainable. This reduces wastes, emissions and CO2 by 30%. Satori supplies a recommended Feeding Guide in order to help you determine the correct amount to feed your pet. Every pet is unique in its requirements for energy; adjust the amount fed to achieve optimal body weight. It is recommended when switching pet foods that you slowly integrate Satori over a 10 day period. (AAFCO) Dog Food Nutrient Profiles for Adult Maintenance. *Adjust feeding if your pet’s activity level changes (Example: Reduce in winter if they are less active). **Control the amount of calories your pet receives from other sources such as treats. ***Pregnant and Nursing Females may require additional nutrition to support their energy needs.